Pieter Brueghel the Elder gives us another ugly Jesus baby, but this time it’s Political. You can tell as soon as you look at this painting of the Adoration that Pieter Brueghel was one weird dude. Most of Bruegel’s work had quite a bit of humor and chaos, creatures and people and things kind of just flying everywhere. In his 1564 Adoration of the Kings, we see some more controlled chaos, but still very many Brueghel elements. There is quite a bit going on; a crowd of people all jumbled together, a lot of competing outfits, and a centrally located naked old man baby, that’s Jesus, ever heard of him? Namely, everyone is portrayed realistically, which is art speak for kinda ugly. What Brueghel is really trying to do here is throw shade at Catholics and inquisitors and give props to peasants. If you’re unfamiliar with the scene it is depicting, the Adoration is a biblical scene portrayed ad nauseam when 3 Kings found out about the birth of the King of kings (Jesus) and went to bask in His glory. Brueghel considered himself an artist of the people, and therefore painted his figures with realism. This Voldemort baby is in no way mocking Jesus and all the good stuff he would do. Instead, Jesus is realistic because while he was divine he was still a baby, and although I’m not supposed to say this, some babies are ugly. Unlike other painters before him, two of the three Kings are depicted as somewhat old, instead of fresh faced and handsome. Joseph is also looking...wise with a graying beard and wrinkly face. This depiction of Joseph and the Kings is breaking painterly tradition with idealizing biblical heroes, as Brueghel wanted people to see themselves and people they knew when they looked at this painting. Some of those weird faces are satirical though, namely the soldiers and the man whispering sweet nothings of doubt in Joseph’s ear. These artistic choices are all comments on Brueghel’s religious and political realities, he painted this during the Inquisition (which nobody expected). If you are unaware of the Inquisition, just know it was a bad time in which many European countries were occupied by Spanish soldiers and towns were pillaged and people burned at the stake for not being Catholic. The presence of the soldiers is a subtle eff-you to all the inquisitors who were starting to make their way in Brussels again. Eventually, Brueghel himself would have Spanish soldiers stationed in his home, and before his death asked his wife to burn some of his more saucy works. So you are right, that baby does look funky, but it’s not just for your amusement, it is part of a greater political message that Brueghel is trying to communicate. But keep it on the DL, because none of us are trying to get burnt at the stake. Bonn, Robert L. Painting Life : The Art of Pieter Bruegel, the Elder. New York: Chaucer Press Books, 2006. Dello Russo, William. Bruegel. Masters of Art (Prestel Verlag). München: Prestel Verlag, 2012. Meganck, Tine. Pieter Bruegel the Elder : Fall of the Rebel Angels: Art, Knowledge and Politics	on the Eve of the Dutch Revolt. Cahiers Des Musées Royaux Des Beaux-arts De Belgique ; 16. Milano: Silvana Editoriale, 2014. Michel, Emile, and Charles, Victoria. The Brueghels. New York: Parkstone International, 2012. Accessed December 2, 2018. ProQuest Ebook Central. In the chronological sequence of Bruegel's work, this painting of 1564 marks an important departure as the first to be composed almost exclusively of large figures. The group of people, taken from Italian mannerist painters like Parmigianino, permits Bruegel to concentrate on individual faces, giving each a quite distinct, and sometimes grotesque, expression. This emphasis on the uniqueness of each figure, and Bruegel's lack of interest in depicting ideal beauty in the Italian manner, makes it clear that although borrowing an Italian compositional scheme, Bruegel is putting it to quite a different use. In this treatment, the painter's first purpose is to record the range and intensity of individual reactions to the sacred event. 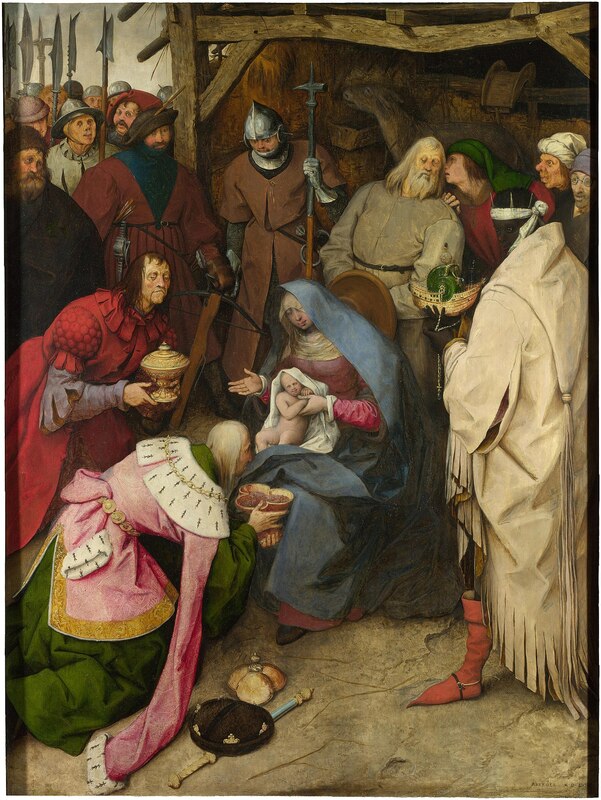 Check out the full Wikipedia article about The Adoration of the Kings (Bruegel).